From the book written by Bruce E. Burgoyne, Waldeck Soldiers of the American Revolutionary War, I will summarized the most important facts about the 2nd and the 3rd Company of the Waldeck Regiment. Since Henrich Lange came from Wirmighausen, just as Philipp Lange did, and since he was part of the 3rd Company, I thought it might be interesting to list facts about the 3rd Company and not only of the 2nd Company (Philipp’s Company). Also, the HETRINA database indicates that Heinrich was part of the 2nd Company of the Waldeck Regiment at some point in time. Burgoyne, though, indicates that Heinrich was part of the 3rd Company of the Waldeck Regiment all through the ARW. I don’t know yet if Philipp & Henrich were somehow related, since they lived in the same community when they enlisted in the Waldeck Regiment. Wirmighausen is presently a rural community of 415 inhabitants. Only two other men from that community were part of the ARW. Until recently, I knew that Heinrich and Philipp LIVED in Wirmighausen when they enlisted in the German army. But, Burgoyne wrote that they were BORN in Wirmighausen. Read what Bruce E. Burgoyne wrote about the Waldeck Regiment. His writings help us understand the real significance of the desertion of Philipp Lange (Philip Long) from the Waldeck Regiment. I don’t think he was a coward, a soldier of weak character, an opportunist or anything of that nature. Maybe I wasn’t very far from the realty when I said that Henrich and Philipp behaved like two daring cowboys. Of course, this is purely speculative on my part. « Of all the so-called Hessian units employed by England during the ARW, none traveled more widely nor had more interesting experiences than the 3rd English-Waldeck Regiment. This contingent of men from the smallest of the six lands which provided soldiers for England ---Anhalt-Zerbst, Ansbach-Bayreuth, Brunswick, Hesse-Cassel, Hesse-Haneau, and Waldeck---served against more nations, in more widely scattered areas, traveled to more places, and suffered a greater percentage of losses than any other contingent. Originally scheduled to be sent to Canada in 1776, the regiment was sent instead to New York to join the army of General William Howe. After service in the New York/New Jersey area, during which time men from the regiment who were captured were sent to prison facilities in Pennsylvania and Maryland and some entered the American Army, the Regiment was ordered to West Florida. En route to West Florida the transporters carrying the Waldeck Regiment stopped at Jamaica to regroup and to take on provisions and water. They then sailed to Pensacola. From Pensacola part of the regiment was sent to the area of the Mississippi River where the men were captured by the Spanish forces commanded by Bernardo Galvez. After being held captive at New Orleans for about a year, the men were transferred to Cuba, sailing first to Vera Cruz, Mexico. Following their exchange, the men returned to New York. Some of the men held prisoner in New Orleans deserted, went up the Mississippi River, and joined George Rogers Clark to fight against the English in the Illinois Country. NOTE. A grenadier (from French derived from the word grenade) was originally a specialized soldier, first established as a distinct role in the mid-to-late 17th century, for the throwing of grenades and sometimes assault operations. At that time grenadiers were chosen from the strongest and largest soldiers. By the 18th century, the throwing of grenades was no longer relevant, but grenadiers were still chosen for being the most physically powerful soldiers and would lead assaults in the field of battle. Grenadiers would also often lead the storming of fortification breaches in siege warfare. According to a treaty (contract) dated 20 April 1776, the German principality of Waldeck supplied a 670-man infantry regiment to the England for the ARW, a number that was increased to 1 225 during the war. The regiment was composed of six companies, one Grenadier Company (1st) and five musket companies, 2nd, 3rd, 4th, and 5th Companies. Since these companies never fought alone on the battlefield, they are always referred as English-Waldeck Companies. Philipp Lange’s Company was called the 3rd English-Waldeck Company, a musket company. When associated with the British army, it is called the 3rd English-Waldeck Company. When it is referred independently from other armies, it is called the 2nd Company. At the onset of the ARW, Philipp belonged to a musket company. Philipp and Henrich are mentioned in the book written by Bruce E. Burgoyne, a book that can be considered as an index of the Waldeck Regiment. There is a bio for each Waldecker. Born 1756 in Wirmighausen. Evangelical. Sailed to America with the regiment in 1776 as Private in the 3rd Company. He deserted on 5 April 1777, and returned to duty on 7 January 1778. He returned to Germany with the Regiment and was released at Korbach on 18 October 1783, under other than honorable conditions. Born 1757 in Wirmighausen. Evangelical. Sailed to America with the Regiment in 1776 as Private in the 2nd Company. Listed in the HETRINA as both a prisoner and a deserter in 1777, he returned to duty in January 1778. He deserted again in August 1778. Burgoyne, Bruce E. (2008). Waldeck Soldiers of the American Revolutionary War. Heritage Books Inc.
Burgoyne did his research through HETRINA at Marburg Archives more than 25 years ago. But, he had also access to other documents pertaining to the Waldeck regiment, information that is not part of the HETRINA database. We learn many important facts about these two Waldeckers. (1) Henrich was born in 1756. (2) Philip was born in 1757, while his birth date is not definitive in the HETRINA database today. (3) Philip was made prisoner of war. (5) They are both of Evangelical faith, information that will help me find their birth certificates. (6) The present military file of Henrich in HETRINA today is more elaborate. (7) Burgoyne does not mention that Henrich was part of the 2nd Waldeck Company in 1777 & 1778. (8) Both traveled to America in 1776. (9) Elsewhere in his book, Burgoyne says that the Waldeck Regiment was a musket regiment. (10) Philipp is identified as Philipp Henrich. NOTE. Today, November 25, 2014, I have learned from the Evangelical Church of Germany that neither Philipp nor Henrich were born in Wirmighausen. They lived there when they enlisted in the Waldeck Regiment. It is possible that Bruce E. Burgoyne « assumed » that they were born in Wirmighausen. He did his research at the Marburg Archives and not in church archives. Moreover, since there were three Philipp Lange in Hetrina, it could be wrong to call Philip from Wirmighausen as Philipp Henrich Lange. He’s the only one to add « Henrich » as a second name. From the David Library in Pennsylvania, I’ve also learned that Philip is listed on the muster roll coverering most of the year 1777. So, it seems that Philipp Lange was not made prisoner that year. He would not have deserted also. 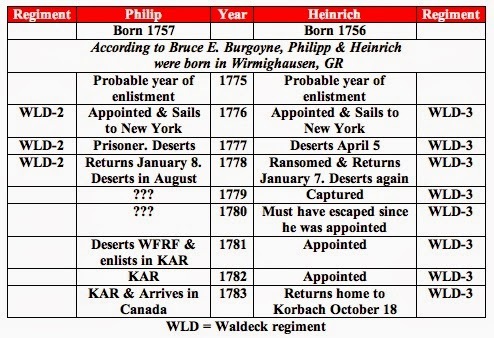 I don’t know how Bruce E. Burgoyne was lead to write that Philipp was born in Wirminghausen, that his name was Philipp Henrich, that he was captured in 1777 and that he deserted that same year. 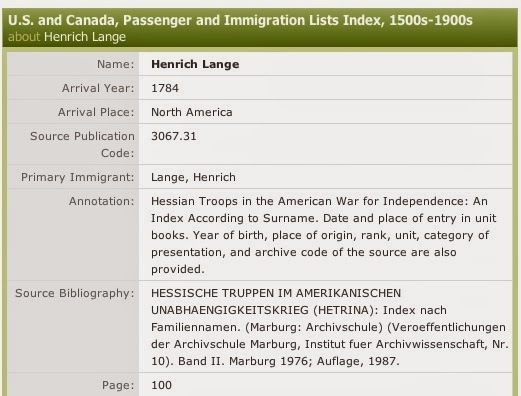 The indexes that mention Philipp Henrich Lange are based on the book by Bruce E. Burgoyne. All the documents that I have on hand from Hetrina don’t mention that Philip was captured in 1777. On December 15, 2014, I learned from a professional genealogist and historian from Marburg, Dr. Thomas Heldt, that the Name of Philipp Henrich Lange does not appear anywhere in the military file: everywhere the name of Philipp Lange is used. 4. Did Philip had a brother when he arrived in Canada in 1783? In 2010, I learned from Audrey Prentice that her mother, Lorette Long-Prentice, was convinced that Philip had a brother who stayed with him in Fredericton and accompanied him when he moved in Quebec. His name was John. The other elements of her mother’s story paralleles what Mgr Ernest Lang reported as the oral tradition of the Long/Lang family. My recent research does not give credence to that oral tradition as a whole. Why, then, should I believe Lorette’s story about Philip having a brother? I would, if I had a wall-to-wall documentation to support it. Heinrich left America for Germany in 1783. Did he came back afterwards? One thing is sure, many of them did came back to live in Canada and in the United States after 1783.
of Henrich in America (New York) in 1776. Now, here is the document about his arrival in 1784.
it means that he came back to Canada in 1784. He probably arrived in the port of Quebec (North America). So, there « might » be some truth about Lorette’s story. 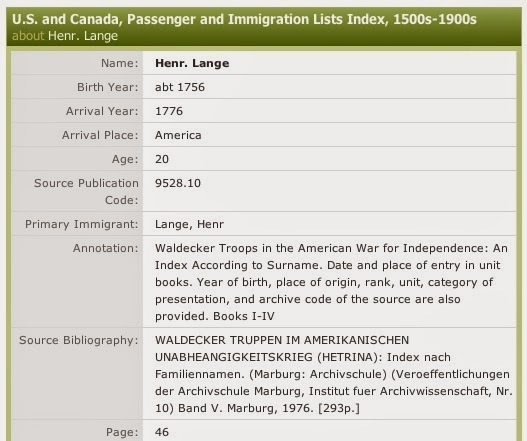 I cannot confirm that the above immigration file is about Henrich Lange of the Waldeck Regiment. There were a few Henrich Lange in the Hessian regiments. It could be just as easily attached to anyone of them who had decided to come back to Canada. 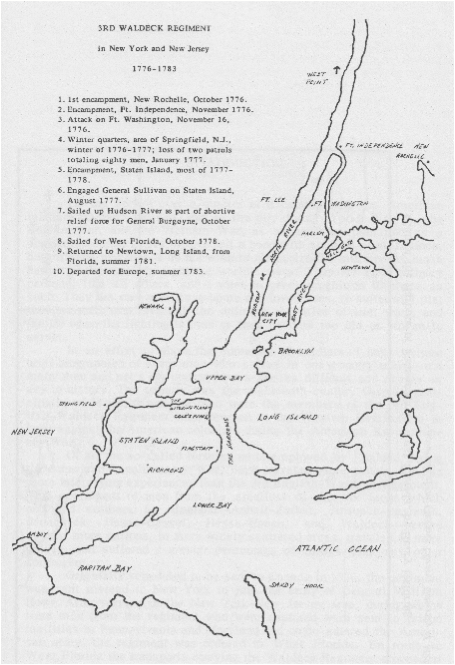 Before 1784, Henrich had not set foot in Quebec: the Waldeck Regiment arrived in New York in 1776 and kept going south for the following five years. It seems that I have to look now for a Canadian citizen by the name of Henry Long...He was probably baptized John Henrich Lange. From Burgoyne’s book, we learn that desertion had another meaning, besides those discussed elsewhere. Soldiers who were captured preferred to desert to the enemy instead of waiting to be exchanged. The living conditions in prison were unbearable. So, desertion was a short cut to freedom and its home regiment. This explanation only makes sense if the soldier returned to his home regiment. If he stayed on the enemy’s side or went home, desertion must then be considered as leaving the regiment once and for all. A Hessian soldier could desert to the enemy for a while and return to a Loyalist Militia Company: Todd Braisted of the Loyalist Institute is quite affirmative on this matter. In such an instance, the soldier had decided to stay in America after the ARW while continuing to be loyal to his King and his Country. In line with my research hypothesis, that’s just what Philipp did. This kind of desertion was a common practice during the ARW: I have gathered a lot of Hessian military files to back this assertion. Many soldiers enlisted in a Hessian regiment hoping to immigrate and travel for free to America. Moreover, before leaving for America, the German officers were expecting desertion during the ARW at the soldier level and even on the officers’ level also. From Burgoyne, we learn that Philip was made prisoner in 1777, but returned to his regiment soon after in January of 1778. This fact has not been registered in Philipp’s military file in the HETRINA database. Burgoyne had the opportunity to revise all the military files of the Waldeckers on-site at the Marburg Archives in Germany. I’m in contact with an archivist at Marburg and I will certainly have an explanation soon for that discrepancy. In August of the same year, Philipp deserts to the enemy for the second time. Nevertheless, we have no documents to show his whereabouts between 1778 and 1781. His name is not mentioned in any Continental muster roll during this particular period. If he worked for a Continental Regiment, it wasn’t long enough to appear on a muster roll. Since Philipp left the German army for the British army, it is obvious that his first desertion to the enemy didn’t last very long and that it was probably a way to get back to his Waldeck Regiment, like so many did when they were made POW. As for his second desertion in 1778, it is clear that he had decided to stay in America from then on. He did not desert to the enemy, but to a Loyalist regiment. His enlistment in the WFRF and in the KAR Regiments proves beyond any doubt that he didn’t want to go back to Germany after the ARW. Heinrich followed a different path: he went back home in 1783 and stayed loyal to the German army all through the ARW. Nevertheless, as you have just read, it is possible that Heinrich came back to America after his discharge in Korbach, Germany. How many Waldeckers were made POWs in 1777? 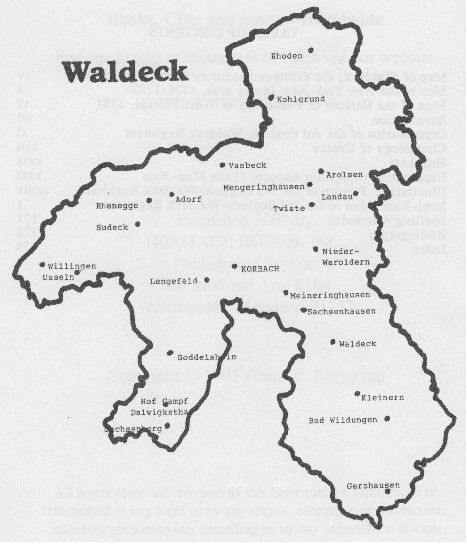 In 1777, many Waldeckers were made prisoners-of-war. For each of the following dates, I have listed the number of prisoners. Many POWs escaped while they were in captivity. They were not put behind steel bars. Many of them worked on farms, for instance. And to have more opportunities to desert to their home regiment, many would agree to join the enemy, the Continentals. This increase in freedom gave them even more opportunities to escape. But, many preferred to stay on the enemy side, since they were permitted to let down their gun one day and take on farming the next day. The loyalty of the Hessians soldiers was especially tested during their captivity. The Hessians knew they could become land owners simply by deserting. Philip kept on fighting for England and Germany all through the ARW. Once in Canada, he stayed loyal to the British government until the end of his life. For many reasons, it is important that we learn about the real significance of desertion during the ARW. Was Philip a coward or a cowboy? The living conditions during the ARW were simply unbearable for most if not all of the soldiers. Let’s not make Philip a hero because he stole a mail bag. The misery that everybody involved in the ARW had to endure is unimaginable. Nobody deserves to have the monopoly on heroism in such a war. Philip must switch from a German regiment to a British regiment during the ARW if he is to « become » my ancestor who was part of the Loyalist regiment called the King’s American Regiment. NOTE. Bremerlehe was and still is an important port. 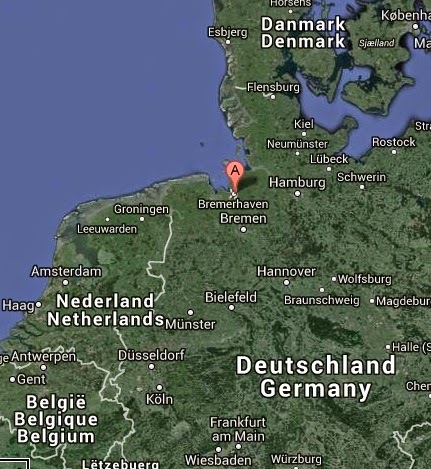 The city is now called Bremerhaven. It is obvious why this port served as a strategic departure and arrival location for the Hessian troops during the ARW. 8. What were the living conditions of the German mercenary soldiers? The subject of mercenary soldiers has always been controversial. Since the mercenaries are fighting without any other cause than earning a salary, many feel that putting one's life on the line is worth a lot more. Fighting is acceptable only if it is to satisfy a more noble cause. The definition of « noble cause » is opened to subjectivity. Maybe war in unacceptable, no matter the cause. Frederic the Great says in a letter to Voltaire, dated June 18 l776: « If the landgrave had come out of my school then he would not have sold his subjects as one sells cattle to the slaughterhouse; this is a despicable feature in a Prince who wants to be a model for other Princes. Such an action can be cause only by a high degree of detestable selfishness. I feel sorry for the poor Hessians who have to waste their lives miserably and without purpose in America ». The living conditions of the Hessian soldiers are well documented in all the books I have read on the matter. The descriptions are often gut wrenching. The soldiers suffered from hunger, cold, disease, fatigue, thirst, injuries, lack of proper clothes, fear, and a lot more. The Hessians suffered also from the temptation to desert, because the offer from the Continental side was very interesting. Deserting meant quitting the battlefield and becoming the owner of an already set-up farm: a fork for a gun! The Hessians were amazed by the freedom enjoyed by the Americans and by the salary the tradesmen were earning. The way of life of the Americans had quite a psychological impact on the Hessians. Those who were held prisoners in Pennsylvania found themselves in German communities that made America even more inviting. The number of desertions during the ARW and discharges at the end of the ARW is not surprising. Many authors, including Volm, have said that the Germans were less likely to desert than the British. Besides Pennsylvania, it was very difficult for a Hessian soldier to go unnoticed in a community. 9. The recruiting methods in Germany: get aboard or we’ll get you aboard! « If we go through the records carefully, we find reports that entire shiploads of soldiers refused to go to America. The enlisting of soldiers was frequently carried out in the cruelest manner. The recruiting officers went through the country, took the peasants away from their families and homes, and drove them like a herd of cattle to the barracks. These unfortunates were under the strictest guard; each attempt at running away was bloodily avenged ». 10. How were the prisoners-of-war (POW) treated? The 4 000 prisoners and guards in Boston were moved down south because of the lack of provision and clothing. They walked 628 miles in three months to reach Virginia where the weather was milder. But, they had carried their misery with them, unable to leave it behind. Nevertheless, everywhere they went, the German prisoners made themselves useful, surely because many had skills in different fields, especially farming. They did just that when they arrived in Charlottesville, Virginia, where the community was understandably upset with their arrival. It’s not an easy task to summarize the impact that the Hessians had in America where they fought Rebels, but fought also unexpected enemies like hunger and diseases. Volm showed in the conclusion of his paper that he had understood how much the Hessians have suffered between 1776 and 1783. « In summing up, I may say that the German troops played a great part during the American War of Independence, at least for the Americans, since they were hated and feared by them and their presence nerved the Americans to greater resistance. But this hatred and fear lost their biting sting when the Americans came in closer contact with the Germans, in their captivity. Although the prisoners endured many a hard trial, they nevertheless saw many good features in American life by which they were attracted, and not few of them finally decided to settle down here and become coworkers in the structure of our modern American life ». Volm, M. H. (1937). The Hessians Prisoners in the American War of Independence and Their Life in Captivity. University of Virginia.